“Arizona is now the frontline for the struggle of rights and liberties – ground zero for the struggle for justice in this nation,” says none other than Dr. Cornel West. Having been there and having felt the heart of this battle, I would agree. 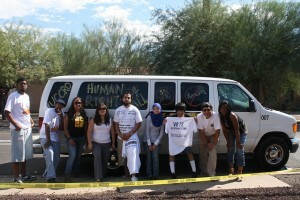 I was in Phoenix, AZ in the first week of October as part of an IMAN and United Congress of Community and Religious Organizations (UCCRO) delegation that drove down to do Voter Registration work with Promise Arizona (PAZ) and to be in solidarity with our Latino brothers and Latina sisters. PAZ is fighting through the political system in Arizona to stop and reverse the effects of SB 1070, the discriminatory state law that is separating immigrant families. Once there, I had the feeling right away that this struggle is broader than immigration rights, in more than one way. It is broad in that I could see my own struggles and those of other marginalized communities in it, and it is also broad in terms of the impact it could have on what kind of society we will have in America, now and into the future: Either a society where basic dignity and meaningful citizenship is continually expanded to include a diversity of individuals and groups, or a society that limits such dignity and citizenship to the already privileged individuals and groups. While in AZ, I saw a community in fear and facing uncertainty, but also a community that is defiant, digging in for the long fight and starting to find its voice. However, I also saw something that concerns me a little; the immigrant Latino/Latina community in AZ mostly stands alone in this fight, at least right now. Building movements of solidarity between marginalized people is indispensable to meaningful and long-term successes in the face of many of these struggles. While we were down there, we sent two delegations – one to a local African American church and the other to a local mosque – but building solidarity needs time, prioritization and can sometimes be hard to do in the heat of a struggle. It needs a long-term focus and commitment. One last feeling I came back with was of gratification. I am thankful and proud that IMAN and UCCRO decided to send this long-distance delegation to stand in solidarity with the Latino community in their moments of struggle. I will be looking forward to other events and engagements around the issue of immigration in the near future. These problems are longstanding and complex and the response required to resolve them in a manner that enhances the dignity and opportunities of all must be equally sophisticated and long-term. My experience in Arizona was, to say the least, a very new one. I was completely unaware of what voter registration would be like when I arrived there, except I knew that we had to go to Arizona to do it to help the immigrant community vote, so legislation such as the Dream Act could be passed. When we first began registering voters, I wondered if it would make much of a difference at all. However, by the time I had started to do some work, I began to see it differently – that if enough immigrants registered to vote and got their voice heard, then they could make things better for the other immigrants, ones who are “undocumented” and can’t vote. And I would like that, because I have a close personal connection to some people that are dealing with these very same problems. So although I still may not have liked doing voter registration and even if I wasn’t very good at it, I could at least say I tried to help my brothers and sisters in the immigrant community by registering people to vote. One thing that struck me on this trip was how hard registering voters actually was. I had expected it to be much easier, and be some sort of sit-down work where people would come to you to register. When I heard, during our training on the first day, that our host organization, Promise Arizona (PAZ), had registered 10,000 voters with all their efforts, I thought it was a really low number. However, when I actually got out there and experienced for myself how hard registering voters was (how about getting kicked out of Wal-Mart at least three times?) I thought it was a miracle that they had got to 1,000, let alone 10,000. It doesn’t help that I have never been good in social situations such as voter registration where you have to approach people and ask them to register, but I got the general feeling that voter registration was hard for almost everyone. The companionship with the folks during the trip was enjoyable. It was indeed entertaining to hear some of the stories told and to talk about some of the sports going on at the time. However, there were a few times when I felt out of place as the only “kid” in the whole group. The sense of fear, concern, and insecurity is palpable. Sunday, as we went out to register voters for the first time in predominantly Latino/a neighborhoods and shopping areas, we met with a wide range of reactions: some registered, some didn’t need to, some didn’t care, but many many more couldn’t or wouldn’t (“undocumented,” “felon,” non-citizen, “makes no difference,” etc.) register. Some thanked us, some were upset at us, many were just surprised to see us (black and brown Muslims and others) doing this work. Show me a person or community in fear like this and I can almost always show you some (systemic) injustice at bottom. Silence often follows fear, and then more fear can follow. And once an individual or community is scared and silent, those with power over them can get away with saying or doing just about anything. One possible way of breaking this cycle of disempowerment is for other individuals or communities to raise their voices in solidarity with such a marginalized individual or community. Sunday had started earlier with Josina, Taheesha, Rebecca, Haseeb and Nabeel joining the First Institutional Baptist Church congregational services and Hazel, Mark, Hassan, and I attending a Council on American-Islamic Relations (CAIR)-AZ board and staff meeting. We were provided opportunities to speak at both places and tried to impress on both communities the need to recognize the connections between their struggles and the fight against SB-1070. While such recognition and its prioritization is always a process, the initial reactions we got from both these communities were enthusiastic and positive. After the CAIR-AZ meeting, our team was also able to have a meeting with Board members from the Islamic Community Center of Phoenix. Here, while the leadership seemed to recognize the urgency of joining the struggle against anti-immigrant policies and rhetoric, the congregation, ironically predominantly immigrant itself, seems to have mixed feeling about the need and benefits of such solidarity. The reversal of such misgivings can, again, only be a process. But it is a process that needs to be engaged urgently. A good place to begin: who all needs to be part of this and how can they find the needed resources. Later, we all were off to register voters, which brings me back to the fear that I mentioned above. It also brings me how hard such “pound the pavement,” “rubber meets the road” work is. Change certainly does not come cheap. Somewhere during all this we managed to get some (great) soul food at Mrs. White’s on Jefferson Ave. Big up to Rebecca for ordering, and sharing with me, that Peach Cobbler. Yummm! Her and I even talked about sneaking back to that place on Monday just for that. Despite the intense and suspicious gaze currently focused on American Muslims, we are still struggling to make ourselves relevant to the burning issues of our time and place. Unless we engage in these issues, as a community of principles and not just one of opportunism, we will continue to make it easy for those who would marginalize us in the public discourse and in the popular image. Perhaps there are few issues more burning than the broken immigration system of our nation. The genuine complexity of this longstanding issue is being combined with political and social demagoguery to marginalize, even criminalize large segments of the Latino immigrant community. Given (i) that a large part of the Muslim American community is immigrant and (ii) the obvious connections between the images and policies used for marginalizing Latinos in immigration- and Muslims in national security-related debates, one would have hoped for a quick and firm recognition of where our interests, not to mention our principles, lie in the immigration debate. In fact, actions not just words of solidarity would have been expected by now. Sadly, however, the American Muslim community continues to struggle not only in finding its voice but even is grasping the dangers (of isolation) and the opportunities (of solidarity) that confront it here. IMAN and its partners in the United Congress of Community and Religious Organizations (UCCRO) have long been speaking with a clear voice and acting on this issue. For us, the rights of all immigrants to basic human dignity and of keeping their families together are basic human rights that must be guaranteed. As such, this “caravan of solidarity’ headed down to Phoenix, Arizona is part of an ongoing commitment to not letting our Latino brothers and sisters be isolated and scapegoated for our impractical and broken economic and immigration systems. As I look forward to the next few days, of working with our Latino/a brothers and sisters and initiating ties of solidarity, I am both very excited and a little nervous. Such is the fate, I am reminding myself, of those who dare to act and dream to build bridges to new places.